Roses should be pruned each year to keep the plant healthy and promote the fullest and best blooms. 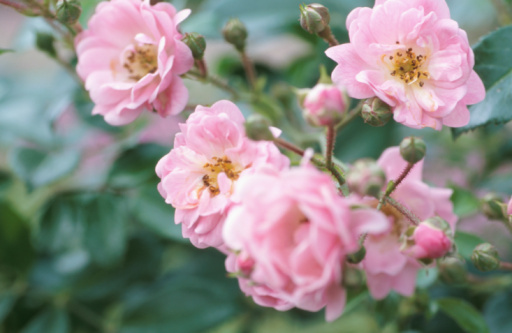 If your rose bush has been neglected, it may not be too late to return it to a healthy status. Once you have cut out all of the old, dead or diseased canes, the plant gains increased air flow and you gain a healthy bush with blooms to enjoy throughout the growing season. Pruning rose bushes promotes healthy growth and abundant blooms. Put on a long-sleeved shirt to protect your arms from the thorns on the plant. Wear thorn-resistant gloves. Leather or coated gloves are good choices. Dip the blades of your pruning equipment into hydrogen peroxide to disinfect the blades before beginning. Cut an area out of the side of the bush with hand pruners to allow access to the center of the plant. Reach into the center of the plant to cut out dead or dried-out canes. Cut out all dead canes at the base of the plant. Use the loppers for the thicker canes and the hand pruners for the smaller canes. Select one-third of the remaining strong canes to stay on the plant. The canes should be about the diameter of a pencil. Remove the rest of the canes using the hand pruners. Cut the remaining canes down by one-half to two-thirds of the plant. Cut the stems about 1/4 inch above an outward facing leaf bud at a 45-degree angle. The cut should slant away from the bud. Apply wood glue to the cut stems to seal them and prevent wood borers from getting inside the stems. Trim all leaves from the remaining stems. Dig down to the root to remove any suckers. Tear them off where they originate to prevent additional suckers from growing. Clean up any leaves that drop to the ground around the base of the plant to prevent the spread of fungal disease that may be present in the leaves. Apply rose plant food around the base of the plant.